Joining up the pieces. Peroxidation of ethyne. More joining up of pieces. Stereocontrol in the ring opening of cyclopropenes. Years ago, I was travelling from Cambridge to London on a train. I found myself sitting next to a chemist, and (as chemists do), he scribbled the following on a piece of paper. When I got to work the next day Vera (my student) was unleashed on the problem, and our thoughts were published. That was then. Transition state for ring opening of a cyclopropene. Click for 3D. 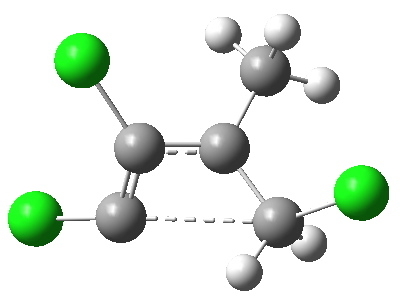 The reaction is a 4n (n=1) electron electrocyclic ring opening and so according to the rules, should proceed with the formation/cleavage of an antarafacial bond. You might think that there are not quite enough substituents to reveal this stereochemistry, but there are if the carbene lone pair is included. So how to add the lone pair? Well, its coordinates can be computed using the ELF (electron localisation function). The relevant lone pair is ringed in red below. Using (old technology, i.e. a static figure) you may choose to believe me when I argue that this lone pair is above the plane of the forming ring from the perspective shown, whilst the terminus of the bond it forms is to the bottom. This defines an antarafacial component. Well, I might have carefully manipulated the viewing angle to show this. Now, in 2012 rather than 1992, you can load the 3D coordinates by clicking below, and check for yourself! What about the stereo-control? Take a look at the angle between the axis of the C-Cl bond (atoms ringed in blue) and the centroid of the carbene lone pair (red). It is about 162°, or almost anti-periplanar. A magic orientation in organic chemistry. Time to attack the orbitals again. Our published diagram looked as below. It shows the HOMO aligning with the LUMO+2 (if your eyes are not distracted by all the other detail). But we can now simplify such a complex molecular orbital by using instead a localized version, an NBO. A little explanation is needed. 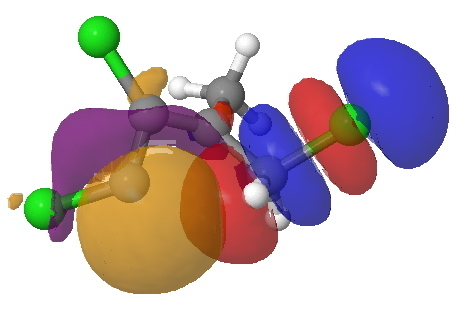 The NBO orbital shown with red/blue phases is antibonding for the C-Cl bond. 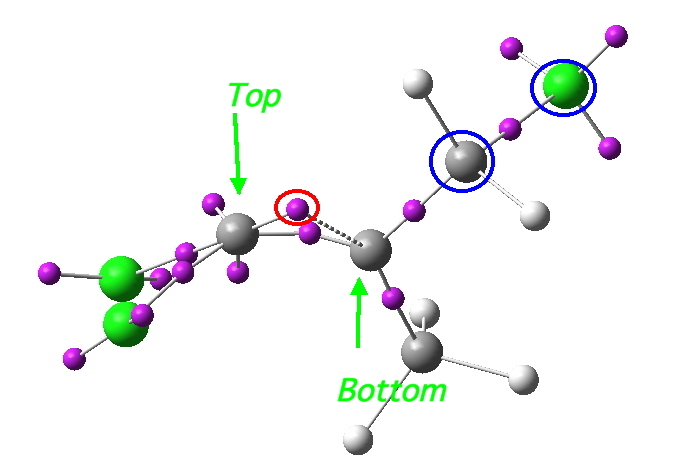 That with orange/purple is the carbene lone pair. Where orange overlaps with red, we have a positive overlap that stabilises the system. The NBO E2 perturbation energy is around 4.6 kcal/mol. Although this may seem small, it is actually quite large for a through-space interaction of this type. 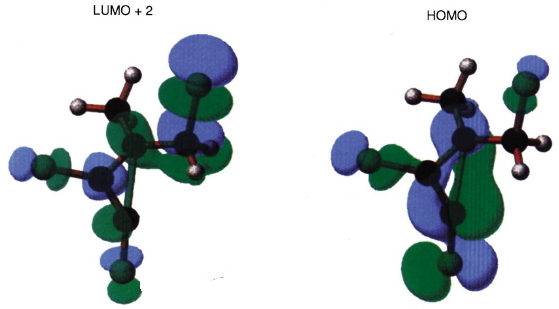 It is this stabilisation (amounting to ~ 1.6 kcal/mol in free energy) that accounts for the high selectivity for the stereoisomer shown above. NBO for transition state. Click for 3D. Well, I think that the passage of 20 years has enabled us to tidy up the origins of the stereoelectronic effect responsible for controlling this reaction, and to produce clearer diagrams which the reader can interactively explore for themselves. It did take 20 years to join things up though! This entry was posted on Thursday, July 12th, 2012 at 4:05 pm and is filed under Interesting chemistry, reaction mechanism. You can follow any responses to this entry through the RSS 2.0 feed. You can leave a response, or trackback from your own site. More joining up of pieces. Stereocontrol in the ring opening of cyclopropenes. is licensed by Henry Rzepa under a Creative Commons Attribution-Noncommercial-Share Alike 3.0 United States License.